Corny title I know, especially to a mixed bag of old bits, some you may know, and some you may not. 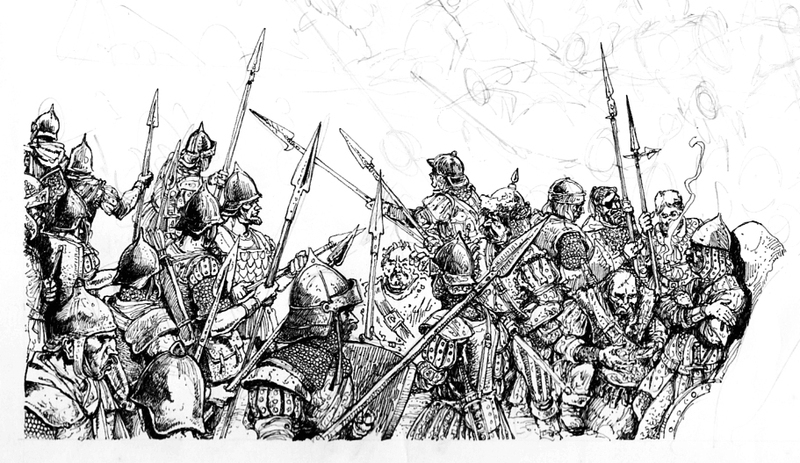 This post will cover 'new' pictures from my White Dwarf battle scene, and some unseen ones related to the work. 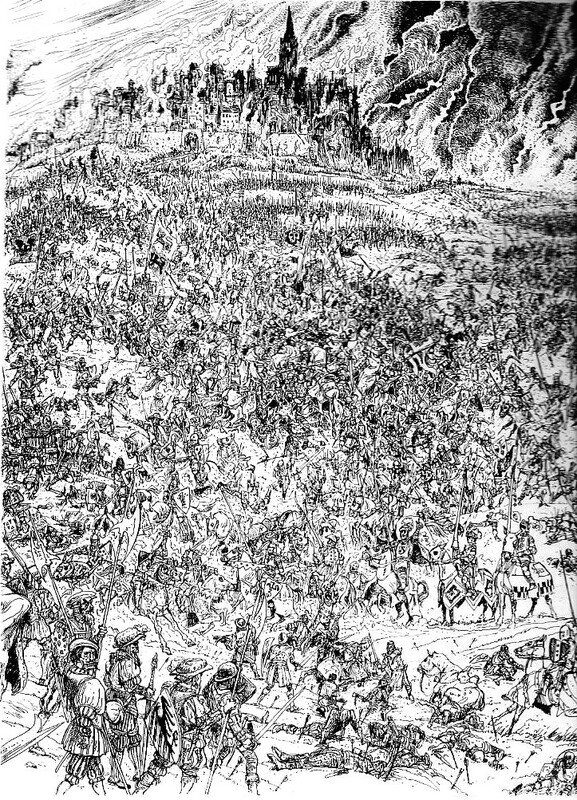 This battle scene you may or not remember, was rejected by the editors, and the owner of Games Workshop [well, he said he was when he phoned]. I was asked for any more detailed images if I could and this I add 'today'. 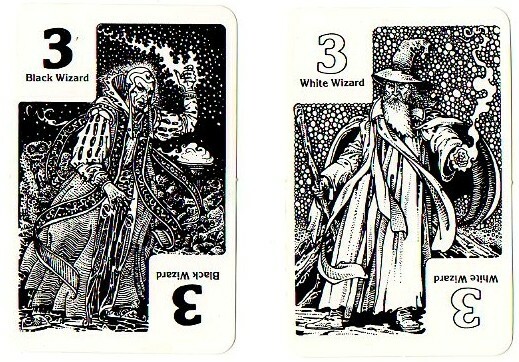 From my early game work for Games Workshop on the board game 'Warlock' for which I designed the playing cards, and lastly from some Fiend Folio related bits which were never used. This was my ''surprise'' mentioned a few posts ago, please don't be disappointed ;). So where to start. 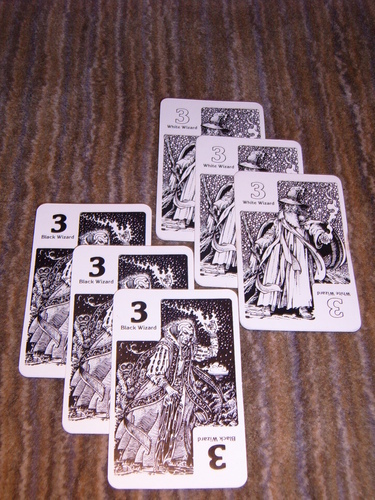 First the board game 'Warlock: The Game of Duelling Wizards'. This was published by Games Workshop in 1980, with a cover by Bob Conner. I note it was later published again in Germany, in 1986, as Warlock - Duell der Zauberer, I believe, and also in Finland, as Warlock velhojen valtataistelu. 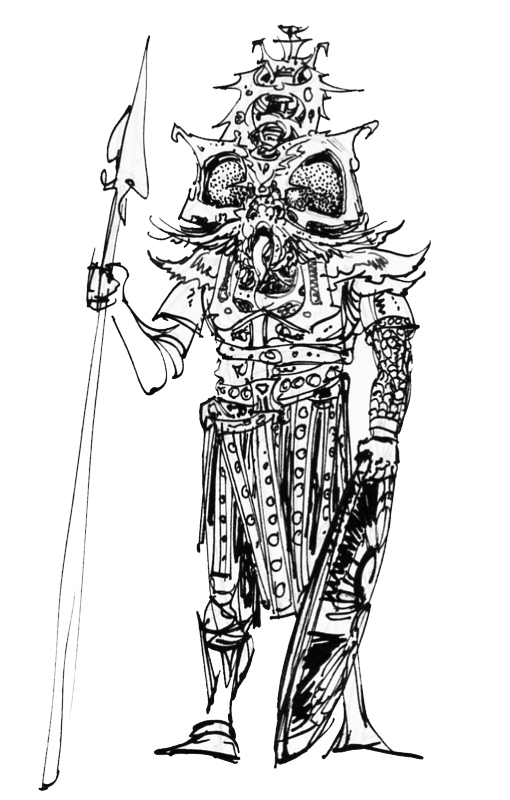 I hope neither company didn't [laugh] use my card designed drawings as I never was paid for any foreign rights, nor in fact did I sign the rights over to Games Workshop. 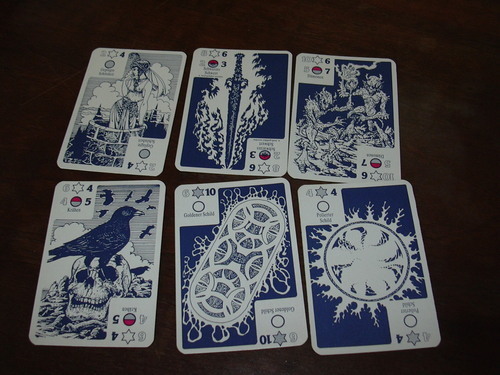 They still own no rights to reprint any of my work, but then again I suspect they don't care [laugh]. 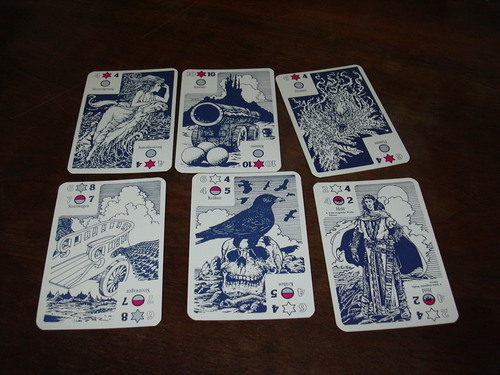 Now these first scans I found posted on the internet by 'Board Game Geek', which is also where I found the other information mentioned above. 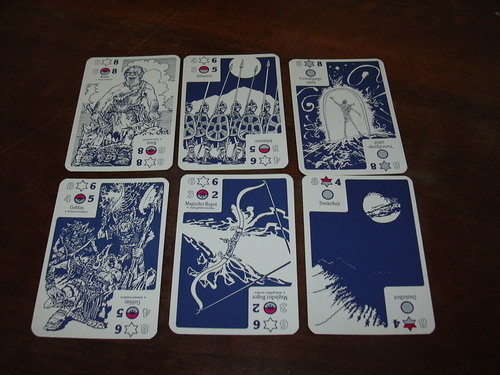 Here below, are some scans of the actual cards from my old squashed box of the game. The colour added [above] must be the work of the 'named' designer Bob Conner. 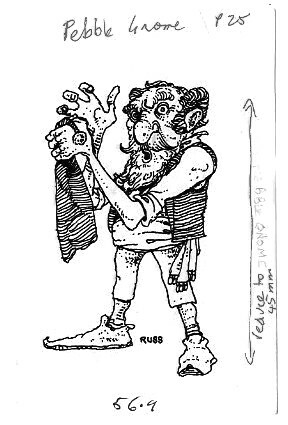 Now, next my 'promised' surprise of Fiend Folio and related White Dwarf magazine spot illustrations from the early 1980's. 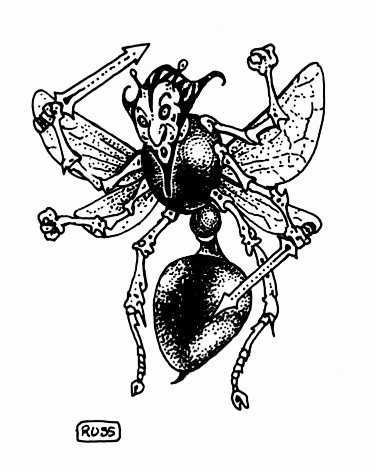 First: Not used in the official TSR Folio but did appear [I think] in White Dwarf ; second: asked for Fiend Folio re-draws because an element was missed out from the wanted image, and last: work I redraw as I was dissatisfied with the first version. These first two appeared, as I mentioned, in the magazine [I think] White Dwarf. As usual, somebody may be able to help or correct my memory. The 'Pebble Gnome' and the 'Satanic Angel'. As you can see the 'Pebble Gnome' still retains some data regarding its printing. They were all small pieces drawn on light paper and you're seeing them about original size. 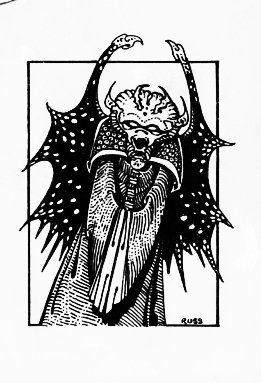 Next are two of the 'originals' from the Fiend Folio that were 'redrawn' due to changes asked for. These were the 'Tiger Fly' [page 88] where originally I had added a weapon, and the 'Pernicon' [page 72] where I was asked to add pincers to his 'tail' and longer antennae. 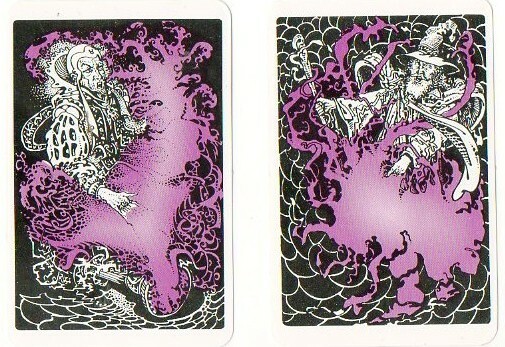 These comments about changes exist on the artwork, I just 'dropped it off' so the image scans were clearer. Lastly, we have the original 'Dark Creeper' [page 22], who does appear more or less like this in the Folio, but I disliked this version for some reason and redrew the image to the one you see in the published book. Sadly, before you ask, there are no other existing pieces at present. 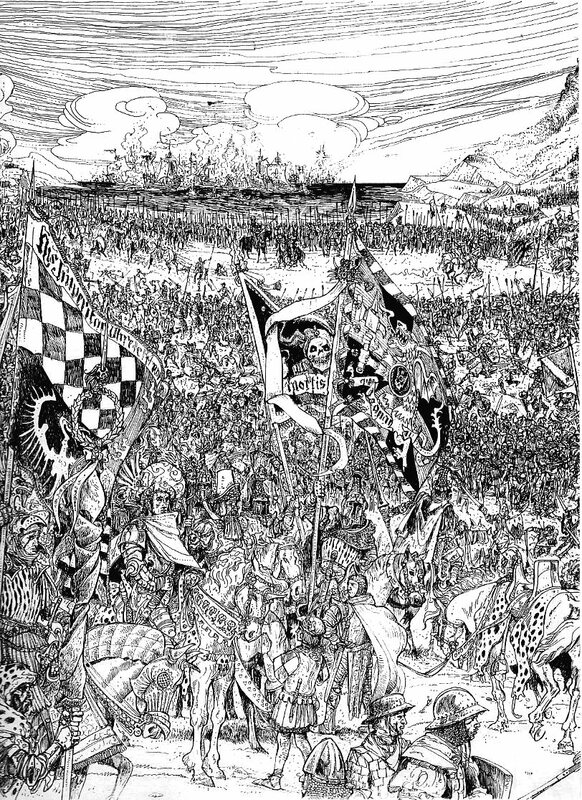 Finally, I have recounted, in previous posts, of how the 'battle scene' that I've been referencing as "The Battle of Middenheim" was rejected by Games Workshop for their publication White Dwarf. I don't intend to go over that again but I've been asked a few questions like was there an official title? Their probably was but this, I don't think, was it. 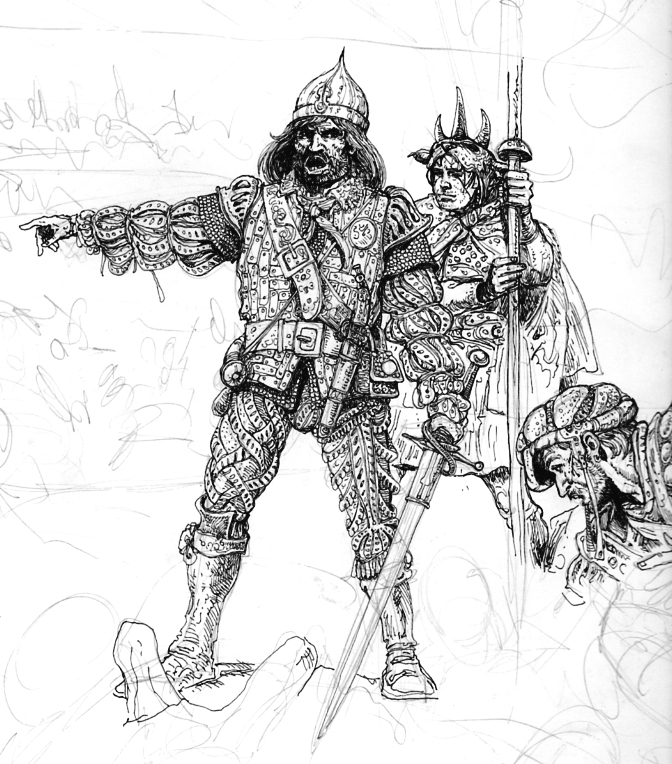 But the commission was related to that world in Warhammer Fantasy, and the city of Middenheim, and I thought my 'new' title was as good as any. In the picture many of the smaller figures and their costumes are actually based on figures Games Workshop used [sold] at the time. I've been asked if I could show the work in more detail, and although it's been sold, came across two photo copies which more or less show the left and right sides. First the left side. This was the side wanted to be used. Next the right side, which they refused to pay for [see previous post]. Sorry for blurred area, which is not part of the work. So here goes... I hope this makes sense. The original commission was for a double page spread that worked out roughly as an A3 drawing in size, which I started to do. But I was dissatisfied with the 'whole'. I always know, because I started to ink portions before I'd tightened the rest of the pencils. With any commission a lot of the work is planning, visualising, and preparing, before I put pencil to 'paper'. But in this case it was all thanks to my [blankety] dog, Arthur, the Bassett Hound from Hell. There is an old urban legend, 'my dog eat my homework'. Well this was something he was prone to do to as when, back when I was teaching, he once 'eat' [slightly] one of my students Art History essays, so I had to say to my student the next day, 'Sorry, the dog eat your homework'. He was not amused. But in this case, I was the one who suffered the 'accident' when the art paper I was working on, for the drawing, was crumbled through the actions of my dog who wanted to show his displeasure with me. I tried inking part of the work, hoping I could somehow rectify the situation, but, as I said, realised quickly it was no use ... I had to start again, and so I went bigger [as you see] and made sure it was kept in a safe place there after when I was out. But two inked sections survived and here they are. Note the under pencilling still is there. I'll finish, with his last questions, and my replies. Tough one .. certainly the very early 90's. My memory has gone as far as that is concerned, it was for White Dwarf so if there is a record when my work stopped appearing ... you have the date. That [comment] gives me pleasure .. you may understand now one of my reasons for not knuckling under to Games Workshops bullying [in my eyes] behaviour, and my professionalism being slighted ...possibly lost a few commissions as a result, but I thought their attitude dire in the extreme. 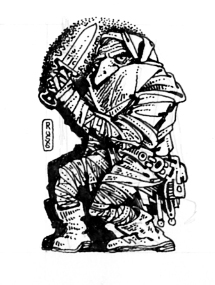 So there you have it for a while when I've scanned some more 'late' Warhammer related work. I believe it is intended, once framed and mounted, for a picture of the large work to be posted onto Facebook, so those with an account, keep your eyes open.